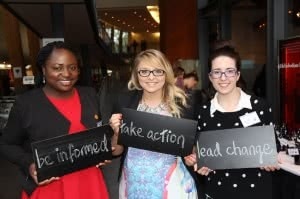 To celebrate International Women’s Day 2014, YWCA Australia launched their annual SHE Speaks survey for women and girls aged 15 – 30. The survey provides YWCA with a deep understanding of the challenges women face in their leadership pathways and also yields important information on the tools young women need to embark on their own leadership journey. The nation-wide survey of 1643 young women was conducted by YWCA Australia and the Institute for Social Science Research at The University of Queensland, and explored young women’s attitudes to and experiences of leadership. In good news for the future of Australia, 71 per cent of respondents said they want to be leaders in the future. And 58 per cent already consider themselves to be leaders in their family, school, community or workplace. Yet the perceptions of gender equality from Australia’s young women are grim. Eighty-eight per cent recorded that women experience discrimination in Australia, while a significant 79 per cent felt that gender-based stereotypes affected their day-to-day life. When asked to nominate the main issues affecting women in their community, the three that emerged were: gender-based stereotyping (79 per cent), violence (73 per cent), and sexist attitudes and beliefs (71 per cent). Read the full survey results or a handy summary. Read a blog post about the results.